An estranged mother and daughter struggle to reconnect while both women are targeted by an ancient demon and its human slave. Professional sculptor and recovering addict Jess tries regaining custody of her troubled teen daughter Chloe after years of estrangement. However, Chloe refuses to leave her group home. Jess’ art model Tira gifts Jess a pendant that she claims will allow Chloe to see the protective love in Jess’ heart. Chloe’s friend Danny Chambers takes her to the former home of Mary Aminov, whom neighborhood children nicknamed ‘Ginger.’ Danny recalls how before her death, an urban legend used to dare them to knock on Mary’s door “once to wake her from her bed, and twice to raise her from the dead,” as Mary was rumored to be a demon’s caretaker who would come for those who knocked. Chloe insists that Mary was responsible for the disappearance of fellow group home resident Michael Flowers. Danny knocks once on Mary’s door. Chloe knocks twice. That night, the ‘Ginger’ demon appears and takes Danny. Chloe begins seeing terrifying waking visions, including an encounter where the creature crawls after her from a sink. Frightened, Chloe reluctantly decides to stay with her mother at the estate Jess shares with her banker husband Ben. Ben soon leaves the two women alone to go on a business trip. Jess has a nightmare of a wailing woman with red hair slitting her throat and her dead body rapidly decaying. After hearing details of the nightmare, Chloe tells Jess the urban legend about Mary, who also had red hair. Jess dismisses Chloe’s claim that Danny disappeared because they knocked on Mary’s door. Tira comes to Jess’ home studio for another modeling session. Tira leaves abruptly when she meets Chloe. Tira warns that a terrible darkness has marked Chloe and she now belongs to someone else. Detective Boardman comes to the house to ask Chloe about Danny’s disappearance. Boardman explains to Jess that when young Michael Flowers disappeared, Chloe and Danny suspected Mary was involved. Kids began harassing Mary by repeatedly knocking on her door, which eventually drove Mary to suicide. Chloe does research and tells her mother about Baba Yaga, a legendary witch/demon that opens a door to Hell so it can devour the innocent. Because the demon’s powers are limited, it requires a human slave who becomes marked. One knock on its door will raise the demon while two knocks summons the slave. The only way for a human slave to break its bond with the demon is to kill herself, or to trick someone else into becoming the slave by forcing that person to commit a truly evil act. Jess dismisses Chloe’s claim that Mary was Baba Yaga’s slave. Mother and daughter continue their efforts to reconnect while strange activity plagues the estate. Conflict comes between them when Jess’ studio is mysteriously destroyed and Jess initially assumes Chloe is responsible. After the demon terrorizes Chloe and separates her from Jess with a closed door, the two women dismantle all of the doors in the house and burn them. As they prepare to leave the house, an invisible entity attacks Chloe and Jess. Jess seeks advice from Tira. Tira explains that Baba Yaga did not curse them. Rather, Mary was driven to suicide for a crime she did not commit and now she wants revenge on Chloe. Clearing Mary’s name by discovering who really took Michael Flowers is the only way to stop her. Frustrated, Chloe runs off alone and is later returned to Child Services by Detective Boardman. While appearing before the social workers in regards to Chloe’s case, Jess notices photographs on the wall of Detective Boardman with the children, including several with Michael Flowers. Concluding that the detective actually abducted Michael, Jess finds Chloe and the two of them sneak out of the building. On the street, a door in the sidewalk opens and Chloe falls in. Jess searches for her daughter at Mary’s house. Police arrive to arrest Jess for taking Chloe, but Jess manages to knock twice on Mary’s door before being taken away. During her questioning, Jess confronts Detective Boardman with her suspicion that he abducted Michael Flowers. Jess further claims that it was actually Boardman’s persistent interrogation that drove Mary to kill herself, not the children knocking on her door. After Boardman leaves Jess alone, the demon comes to her. The interrogation room door opens into a forest and Jess leaves. She follows sounds along a path until she is led to a cave where Chloe is held captive in a cage by Mary and the demon. Meanwhile, Detective Boardman comes to Mary’s house and knocks on the door before entering. After Jess rescues Chloe, the demon pursues them. Jess and Chloe escape through the door Boardman opened while Boardman is left behind to be killed. Ben returns home from his business trip. Tira kills him, and reveals that she bears Baba Yaga’s mark on her chest. Jess tells Chloe that Boardman deserved to die because he kidnapped Michael. Chloe explains that she witnessed Mary feeding Michael to the demon while she was their prisoner, and the detective was not involved at all. Jess and Chloe realize that Mary was the demon’s slave all along, which is why she killed herself to escape the curse. Tira tricked Jess into leading Detective Boardman to his death so that Jess would become the new human slave. The pendant Tira gave her earlier burns Baba Yaga’s mark into Jess’ chest. The demon appears. Jess’ drug addiction didn’t just ruin her life. It also ruined the life of her daughter Chloe, who has paid the price for her mother’s selfishness by living out her teen years in a social services group home. Jess spent that same time putting herself back together. Now she is a sober artist living with her new beau Ben in a pretty palatial estate, and she wants Chloe to stay there with them. Chloe isn’t about to play ‘House’ by pretending Jess can be forgiven so easily. But Chloe comes to consider she might need the safety of family after a witch thought dead comes back from the grave to haunt her. Kids always claimed local recluse Mary Aminov kept a demon in her spooky old house. Dare to knock once on her door and you’d wake her from bed. 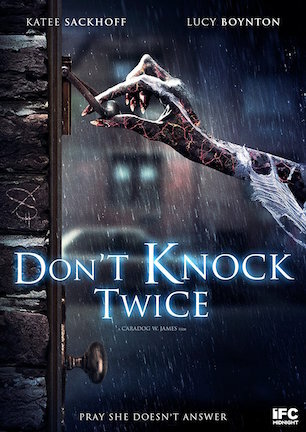 Dare to knock twice and one could supposedly summon the dead. Chloe and her friend Danny took the rhyme so far that Mary was driven to suicide from frustration. Now approaching adulthood, the duo dares to knock once again. Yet when Danny disappears and a creepy creature begins crawling for Chloe, the troubled teen realizes there might be more to Mary than mere urban legend. “Don’t Knock Twice” is right at home on the slate of theatrical thrillers springing up often around January-February. The movie is cut from the same cloth as titles like “The Boy” (review here), “The Forest” (review here), and “The Woman in Black 2,” where the template for early year horror tends to be a strong single woman fighting a personal struggle with one hand, and a supernatural battle with the other. Not that there’s anything wrong with formula when it functions well enough, which is the case here. It just bears noting that the carefully crimped film fabric of this tightly sewn sleeve isn’t hiding a whole lot up it. Keeping “Don’t Knock Twice” from succumbing to the quicksand trap drowning similar films in rote jolts and standardized storytelling is the mother-daughter relationship between its two leads. Oz Perkins favorite Lucy Boynton continues emerging as a transfixing talent whose aura appears inherently tuned to paranormal proceedings. Concurrently, Katee Sackhoff continues evolving from the leather-clad tough girl personas of her early career into mature roles with more character complexity. Both women collectively force the material to have heft on the screen that it doesn’t really have on the page through pure acting prowess. If “parent and child combating a creature” counts as a subgenre, and it should considering acclaim surrounding such fare as “The Babadook” (review here) and “Under the Shadow” (review here), “Don’t Knock Twice” is a notable standout for its sincere familial bond. The monster melds with their melodrama without favoring one over the other, making for a final product more balanced than something like “The Monster” (review here) at any rate. While on the subject of its stars, if he wasn’t already, “Don’t Knock Twice” cements Javier Botet as the third point to Doug Jones and Mark Steger in their triad of go-to performers for lankily-limbed creatures. Andy Serkis gets the AAA attention, although the other three men seemingly spend more time in makeup than out of it when it comes to studio or indie horror. Botet’s movements as the Baba Yaga beast haranguing Jess and Chloe tap their full fear factor potential as Botet reminds once again why his is a name to be noticed. Most of the movie’s energy comes from emotion, though that doesn’t satisfy the suspense quotient for horror hungry audiences. Director Caradog James, who helmed the entertaining sci-fi drama “The Machine" (review here), aptly applies his eye for moody photography, spooky staging, and pulling measured performances from his cast. Where James falls short is in timing the tempo for triggering slow-building beats. Many moments extend rubber bands of tension missing their cues to snap back for a scare. Single note sound setups last for so long, you practically envision the piano key needing to pause for another inhale before resuming its mission to draw out a scene. I confess I’m not sure I followed every detail of the film’s mythology. Is it one knock to summon Mary and two to rouse the demon, or the other way around? I’m not even sure the movie is consistent about its own urban legend and Russian folklore twist, or whether it all adds up in the end. I’m also not sure it matters. Warts and all, the background fiction is intriguingly frightening enough to fit the supernatural story of two women fighting for family through unimaginable horror. Pacing needs a backside kick that never comes. This absent urgency is the bear hug holding back “Don’t Knock Twice” from hitting a swifter stride. Still, Sackhoff and Boynton alone make the movie worth watching. Even with some dull stretches and dodgy dot-connecting, there remains a witchiness in its air that keeps “Don’t Knock Twice” creepily compelling. January 30, 2017 by Ian Sedensky.